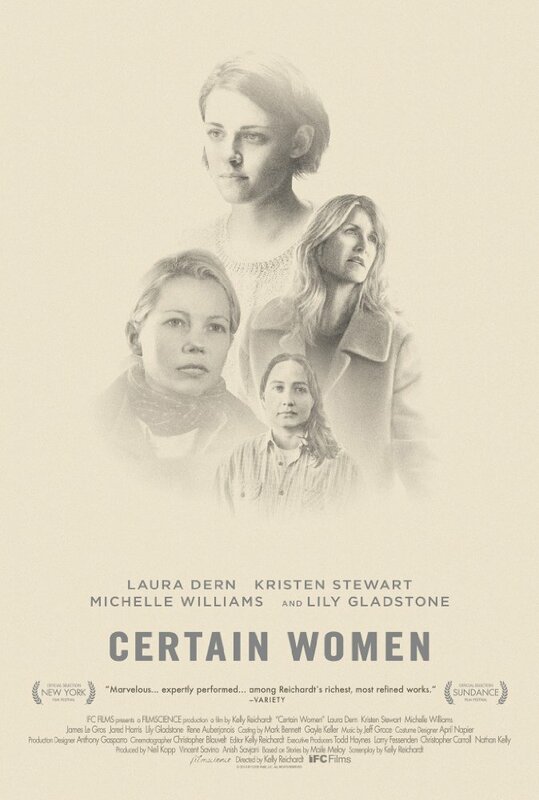 Certain Women is flat and dead, and it is supposed to be, but one struggles to understand why this film needed to be made at all. In a time of gun control issues, racial and police conflict, healthcare reform and myriad other huge life and society changing issues, a film about nothing holds little value. This isn’t an insightful film about nothing. There can be beauty in long shots and quiet moments as directors such as Sofia Coppola and Terrence Malick have proved. This however, is not a film with a secret beauty or thought. It is truly and deeply a film about nothing. There is no depth to the characters. There is no growth. There is no passion. There is no message. There is just nothing. The film opens with Laura Dern as Laura Wells. She’s dressing after having a tryst which is as emotionless as she is. Laura owns and runs her own law firm and she brings her dog to work with her, this alone should be enough to make her happy, right? It appears not, and we learn nothing of the person. Why did she become a lawyer? What gives her joy? Where did she come from? Her story line becomes intertwined with a disgruntled client who holds her hostage. Even at this moment of crisis we witness no emotion. The audience finds itself asking, what’s the point of her story? That there are vapid people? We know that already! The next segment is equally as dank and misty as we are introduced to Michelle Williams as Gina Lewis in a literally dank and misty atmosphere. Again, we learn almost nothing about the character except that she is rude and not close with her husband and daughter whom she lives with in a tent while they build her dream house. There are long shots of her staring off and tense, quiet moments between her and her family. The apex of this section of the film is when she tries to connive an elderly man from historic stones that he has preserved for years. She wants to use them on her property and she has an urgency which is invalid as there is not even a frame for her home. What’s the point of this? That there are women so self-involved and focused on a goal that they manipulate and mar those around them to get what they want? We know that already! The final snail-slow scene contains the only compelling performance of the film, that of Lily Gladstone who is a horse caretaker and only given the name Jamie. She lives a silent and solitary life until one day she follows a trail of cars to see where they are going. They arrive at the local school and she enters the class with the other adult students. The class is being taught by Kristin Stewart as Beth Travis. Jamie becomes enamored of Beth for reasons unimaginable to us. Because she is new to the town? Beth complains incessantly about her four hour drive to teach the class. She is completely self-centered, self-important and self-involved never inquiring about Jamie’s interests or life. This segment ends with the only seemingly human character, Jamie in tears. I love art film. I support the idea of alternate ideas and realities being put on screen. I want people to witness these messages and to support films which are made as works of art. There are countless hungry filmmakers who would love the opportunity to hone their craft, which is why it is shocking that at a time when there is so much to say, and so many people who want to say it, a dead schlocky film like this was produced.